TL;DR: How do we communicate what we understand but cannot define? I was sitting at Waffle House with my husband explaining to him conceptual problems about communicating with non-Eve players about Eve. He does not play Eve but he is fond enough of me that he is willing to humor me and act as a sounding board about some aspects of the game. He does play video games but he truly a casual gamer and he has no interest in MMOs. He does love sandbox games and he will explore every part of Fallout and wander through GTA for weeks at a time. This makes him a very good sounding board. Our discussion, over our lunch, was about how can Eve explain itself to new players. I used my favorite analogy of how you start many games and they tell you that you are alone and naked in the world with a loincloth and a stick. Fifteen minutes later you are clubbing wolves to death and eating canine steaks over a campfire wearing rotting wolf hides and feeling pretty good about life. And this is a normal thing, game after game. You are fabulous even when stabbed, bleeding and climbing a sheer cliff wall while people shoot at you. What that means is that other games set people up to fail in the first few hours or days of Eve. I explained this to my husband and he asked me, "Well why did you make it?" "Well, I read about Eve as a dangerous place where people could kill you. I read a lot and came in suspicious and cautious expecting the other players to ruin my day. I expected it and therefore I wasn't surprised by it when I bumped into it. In a way, I was looking for it and surprised that it did not happen." Banners, popups, warnings, they are all suggested but will they actually work? Will new players believe in the same way that they would believe if they read a few blog posts or followed the news stories? The simple, ominous words of the game mean nothing. We've become immune to it. Everything is terrible. It will be vanquished anyway. Next? If we, as players, needed to communicate and speak with each other, how would we do that in such a way that new players will read and take it in? That was the question that was not answered over lunch. 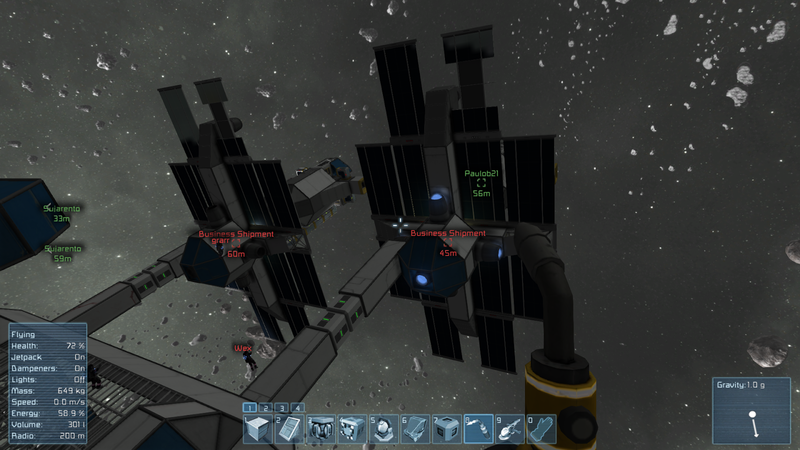 It was later in the day, as I was playing Space Engineers with the other members of Snuff Box that I had a second idea. Eve is a MMO. Space Engineers is not a MMO. However, there were seven of us from Eve working on projects in Space Engineers that made me think that Eve is not just a MMO it is a cooperative MMO. We spend a lot of time saying that you should get friends and play with other people. However, that is not exactly the hallmark of an MMO. After all, MMO's are about many people in the game. A massively multiplayer online game (also called MMO and MMOG) is a multiplayer video game which is capable of supporting large numbers of players simultaneously. By necessity, they are played on the Internet. MMOs usually have at least one persistent world, however some games differ. These games can be found for most network-capable platforms, including the personal computer, video game console, or smartphones and other mobile devices. MMOGs can enable players to cooperate and compete with each other on a large scale, and sometimes to interact meaningfully with people around the world. Is Eve a MMO or is Eve a cooperative MMO? There are a lot of productive, and successful solo players. I don't think that one has to join a group to do well and Eve. It does make it easier but that is because cooperative efforts create working projects in Eve that people can benefit from as a group. So, we have this game where terrible things can happen to you and you can lose all of your stuff. However, if you want to work together you can create huge, sweeping complex projects that thrive from social interactions. What are we actually telling new players? Come join in? Come be alone and live in the world? Come do all of it? By the way you may die or you can try trust and thrive? The message is so mixed. The game itself is mixed. The dystopian future that is Eve's story-line fits terrible into what is going on in the game with how the players interact with each other and their world. Can we look at the huge, massive, complex social contract that has become Sov Null and go, "Wow, what a world barely holding on by threads?" We've been spending a lot of time trying to define and explain Eve and it may just be that Eve isn't really a defined or explained place anymore. The story of New Eden is not the story of the players. We create and build and thrive and prosper. So, what are we trying to even say to people who look to try Eve? We sit back and stroke out wallets and chortle over our shiny ships while telling people to beware the harsh environment, would you like some free stuff? The current task that CCP is undertaking is fixing Eve's core. At the same time, we need to look at fixing Eve's outer shell to. The game is not what it was. The storyline, the world, the ideas and concepts need to be molded back into something that makes sense. And then, maybe then, we can work at figuring out how to prepare people stepping into the world for what the world really is. I've said before that Minecraft reminds me a lot of Eve. So does Space Engineers. And maybe Eve was just ahead of its time but time has now caught up to it. Eve was born in a time of different game-play focuses and did something new and unique by offering a free flowing rail-free world. Now there are others and maybe dystopian futures may not be the path but instead, creation and destruction fueled by personal choice needs to be looked at more. Why do I giggle when I'm dying in Minecraft and Space Engineers and not in Eve Online? What's different? What makes the survival mode of these two games fun and frustrating but the survival mode that is Eve Online something that people rage quit about? Or maybe, that simple warning that Eve is survival mode would do it. Right now we say something along the lines of, "Come play Eve Online but be warned that anyone can harm you and to trust no one except for the group we want you to figure out how to join who will happily help you figure out the game if they don't turn out to be scammers who kill you. Don't worry! The community is great except for the ones you can't trust. Know that loss matters but people may randomly help you while you fight for survival and its everyone for themselves. Hugs and kisses! By the way we have an unoffixal poverty line that so t make sense to.you for a few.months called PLEX. Have fun! Please subscribe!" I just think we're in a box with glass walls and we need to use a hammer instead of window cleaner to look outside of it. As for the cooperative tasks in Space Engineers? The Snuffles figured out how the high jack some NPC transports and bring them in for salvaging to create their own projects. I'm thinking a pack of fighters to go take down one of the military transports. Because nobody ridicules losses in Minecraft & Space Engineers. It doesn't have the ultra toxic culture of losses being a shameful thing that dishonours your space family and is a blemish that can never be forgotten about. Loss is one thing. Being made to feel terrible just because you lost something is far far worse. I wanted to start by saying that I enjoyed reading this article. It was well-written and thought provoking. However, I'm not sure that 'cooperative MMO' is really a useful classification. I can't think of an un-cooperative MMO and WoW might even be more cooperative than EVE; you can't touch the endgame without a group. I'm mainly a solo player but I only thrive in EVE because I cooperate with myself to achieve my goals, using multiple characters and accounts. Core gameplay often involves multiple subscriptions to use a dedicated scout/prober alt, a cyno alt or an off-grid boosting alt. That is hard to sell to a potential newbie. I think the fundamental difference between EVE and Space Engineers is that the latter gives you a lot of control over your gameplay experience. There are two single-player modes and you control player interaction as the host of a server. Is Snuff running a public server with no moderation? That's the only option available in EVE and one that pirates impose on everyone else. It would be interesting to hear if Snuff wasn't playing SE by those rules. In EVE, you can only choose to put up with non-consensual pixel destruction or quit. I agree that CCP has a problem explaining EVE to potential new players but at the end of the day, I think the real problem with newbie attraction and retention is more fundamental than that. A lot of newbies don't actually want to play this amazing sociopath simulator called EVE Online; they want a multiplayer spaceship game with persistent progression. I'm sorry to say it, but I doubt that someone who doesn't want to play EVE [i]"because of CODE"[/i] actually wants to play EVE at all. CCP would have to change the game drastically enough to alienate me to sufficiently appeal to them. My understanding is that EVE was a spiritual successor to Ultima Online and part of the same wave of sandbox MMOs as Star Wars: Galaxies. I haven't brought this up for argument's sake. I think that the histories of these two games will help put my alienation comment into perspective. I guess I would tell newbies that EVE is a game where you can do anything but where anything can be done to you. In the context of a game, 'freedom' is a synonym for anarchy. Do what you like, if you can. We can tell them but can we convince them to.keep it in the front of their mind? My rbles are just chewing through a topic out loud. I may be very wrong. I've never played Wow. I'm also the player who plays to play not plays to complete. My opinion is tinted by rhis. We are playing a survival world with normal meteor showers. We've decided to work together but we all have independent projects and group ones. When I started to play EVE I spent my first few months reading about it far more then I actually played. By the time I ventured into low sec I knew what to expect, however there are probably few people like me who are as willing to dedicate that much time to reading about a game before playing it. Having said that I think that the new players are learning faster, I find far few new players in exploration fit ships sat at planets in low sec, venture pilots often warp out far faster so there must be some degree of knowledge which is being passed on better. Some players just don't quite seem to get the concept of danger as it relates to them, I remember reading the new player chat and there was a gung ho guy determined to head straight into low sec and blow stuff up on his own, despite the various warnings of everyone in the chat. EVE is a game that is an odd balance of needing time to skill up and also just needing the knowledge of the game. Given a new character I could probably figure out a fit that would kill a higher skilled player after a few days of training (and actually have done so before). EVE isn't a game that you can master quickly, it really does take time to learn and not everyone wants that. I have introduced it to two of my gamer friends and neither of them have stuck with, one of them tried 5 times, he loves the idea of it but can't cope with the fact that it really is going to take time to learn and master. He just wants to go out and make explosions. Fundamentally I think that to a certain extent there is always going to be a high attrition rate of new players unless the game changes a huge amount (which I hope doesn't happen). You and I are very similar in this. I second this... Good answer. But I do feel we (CCP.CSM/players) can do more to give the game a better shot at retaining those players who just might be able to make the leap from the Std. MMO fair to EVE. This could be a thirty page essay, but essentially EVE is like life, with spaceships. I know what is legal and what is illegal. I know that if I walk down the street it is illegal for someone to accost me, steal from me, and/or kill me. I also know it can still happen if I am stupid about where and when I walk down the street with a big fat Rolex on my wrist. There is a difference between knowing the law and knowing life. Just as there is a difference between knowing EVE game mechanics and knowing EVE. There is no way to prepare someone for life. One has to live it and figure it out. The difference is that if we don't like life we have only one option. If we don't like EVE we have many. This isn't what the majority of the "gaming community" wants, so our choice is to keep the flavor of EVE or to appeal to a wider market. As EVE players who have made it past the "ragequit because bad people play this game" threshold, we need to be careful for what we wish. If it changed enough to appeal to the mythical "masses", would we still want to play? That is always a question. But, is educating people about what they may be stepping into changing Eve so that we'd not want to play? Same as me, you researched and read up and most importantly, LISTENED and believed what you read... and so your expectations were more EVE-realistic than someone who comes from the standard MMO background, does NOT do ANY research, and thinks the 'EVE is really DANGEROUS' stuff is all Hype... so when they run into it, it freaks em out and they quit... or, they can deal with the griefers and scammers but they don't realize the depths to which EVE is a SOCIAL game and, as we saw at fanfest, they do like your hubby does and try and play EVE as solo casual game and end up simply missioning/mining all-the-live-long-day and just blinging out their Megathron thinking that's how the game is played... never really understanding (or possibly not wanting or being able to get involved in) the social aspects of our very social game. Expectations are the key... and EVE is simply too different from any other MMO so players who are expecting what they have always known, are caught off guard and unprepared. The ways I feel this could be better overcome are in Advertising and in the NPE with missions that TEACH about the realities of EVE and most importantly, teach about how EVE players PLAY the game (the Burners look like they might be a good example of this idea)... not just what buttons to push in your ship and a few ways to make ISK. We also have to continue to accept that the EVE we love and fly in is a niche game... and not WoWinSpace.